Warm your harp before you play. You can warm harps in your hands, in a pocket close to your body, under your arm, or even in a warming pad. Why should you warm your harp? 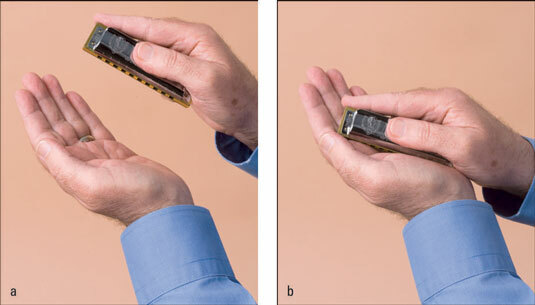 A warm harmonica resists moisture buildup and clogging, and it may respond more readily than a cold harp. Don’t get your harps too hot. You don’t want to melt any parts or set your harps on fire (at least not literally — everybody wants that creative fire). And you don’t want a harp so hot that it burns your lips and tongue. Never place a harp on a heater or a radiator. Keep your harp clean. The first line of defense in keeping your harp clean is not blowing food chunks or syrupy liquids into it. If you’ve just had a snack or a thick or sugary drink, be sure to rinse your mouth out or brush your teeth before you play. The second line of defense is playing with clean hands. Most viruses are picked up by your hands and then rubbed on your eyes or lips. Germs can also be transferred from your hands to your harp to your lips. So washing your hands before you play helps you avoid illness. And not getting sick means you have more playing time. Washing harmonicas isn’t a good idea because some of the inner parts can rust. Some players periodically disassemble their harps and clean all the parts with alcohol, but this is more a matter of personal preference than a necessity. Remove excess moisture during and after playing. The longer you play, the more breath moisture you build up in the harp. This moisture can clog the reeds, corrode some of the metal parts inside, and make wood parts swell and warp. So between tunes and after playing a harp, tap the loose moisture out of it. To do so, simply hold the harp with the holes facing out and tap the holes gently against your palm. Then allow the harp to dry in the open air before putting it away. Store your harp properly. It’s best to carry a harp in a pouch or box — like the one the harp came in. Properly storing an instrument helps protect it from getting clogged with hair, lint, and other foreign particles. It also protects the harp from damage. As your harmonica collection grows, you can get cases, wallets, and even belts to carry your harps.